Take to the open seas with a sailing vacation from Festiva Cruise Club. 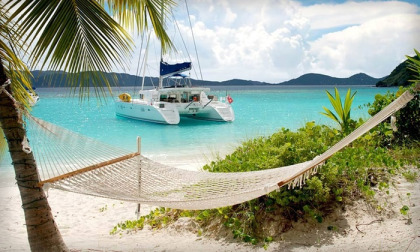 Also known as Festiva Sailing Vacations, you can sail the world’s oceans in your private, fully-stocked and crewed luxury catamaran in an all-inclusive tropical vacation package. Your private cruising vessel comfortably accommodates up to ten guests, with sizes ranging from 44 to 80-feet in length. Buy a Festiva cruise vacation and choose from a variety of tropical destinations across the globe. Explore such exotic locations as The British Virgin Islands’ Anegada, St. John and the United States Virgin Islands’ Cruz Bay, St. Maarten’s nearby island of St. Barts, and the beautiful Greek Isles’ Mykonos area. Whether seeking an adventurous, relaxing, or sightseeing getaway, Festiva Cruise Club offers destinations and activities suitable for families, couples, and solo-travelers alike. Your Festiva Cruise Club vacation includes a fully-crewed luxury sailing catamaran, with air-conditioned cabins perfect for the tropical climate. Most vessels offer four cabins and four bathrooms for guest use, though arrangements can be made to accommodate up to ten guests. Your cabin includes wrap around windows providing unparalleled visibility as you sail, as well as a fully-equipped en-suite bathroom with toilet, sink, vanity, and shower. With unique deck layouts, two trampolines, canvas shading, and ample deck seating, you are sure to remain comfortable and relaxed even while anchored. Festiva Cruise Club getaways are all-inclusive, with accommodations, travel, service, and dining included. Enjoy luxurious meals both on and off-shore – each customized to accommodate your tastes and dietary restrictions. Meals include breakfast, lunch, dinner, dessert, and snacks throughout the day, as well as delicious wine pairings and an open bar. While onboard, enjoy such activities as stand-up paddle boarding, snorkeling, sea kayaking, fishing, and scuba diving - all from the convenience of your own sailing catamaran. Contact Festiva Cruise Club Specialist Today!